Can you ID this person? Who owns a sweatshirt like this? 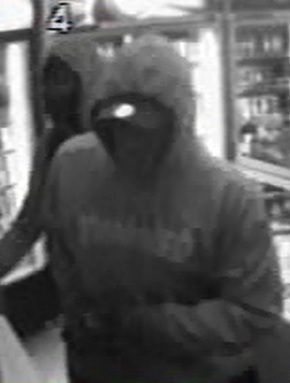 Police are investigating the robbery of a dairy in Riccarton. Police were called to the corner of Riccarton Rd and Wainui St just after 4.30pm, to a report of a robbery in progress. Inquiries at the scene have established that three male offenders have taken a quantity of cigarettes and cash from the store. 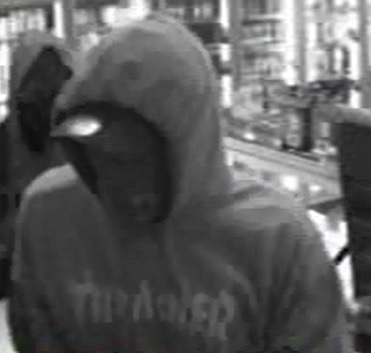 We have also learned that the lone shop worker was struck with a weapon. It’s believed the trio fled in a small blue hatchback car. Two of the offenders were wearing distinctive clothing. 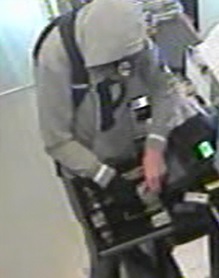 The first two CCTV images show a male wearing a sweatshirt (also pictured in colour), while a second male is wearing a grey sweatshirt with a large distinctive letter “P” on the front with white arm bands around the cuffs. If you know who these people are, or you saw any suspicious activity around the dairy earlier today, please call local Police on 03 363 7400. 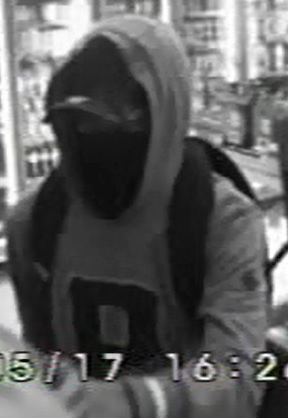 Alternatively, people can contact Crimestoppers on 0800 555 111.